Well, isn't that a surprise: it seems like LG is testing a new Android smartphone. How do we know? 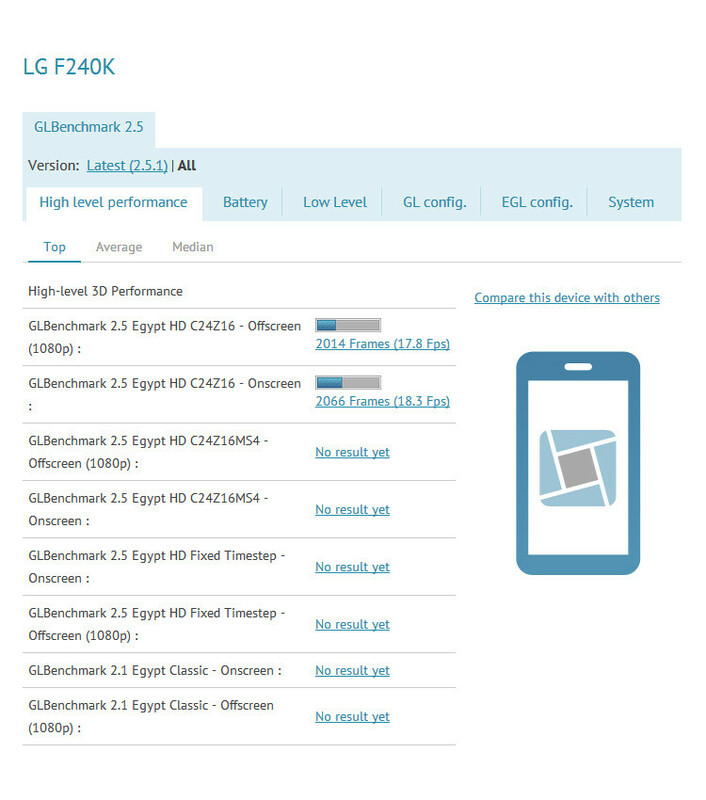 Well, the mysterious device was recently benchmarked and the results are now present on the GLBenchmark web page. It is known as the LG F240K, and we suppose you are already curious to learn more about its hardware specs. What's most interesting about the LG F240K is that it has a screen with resolution of 1080 by 1920 pixels. 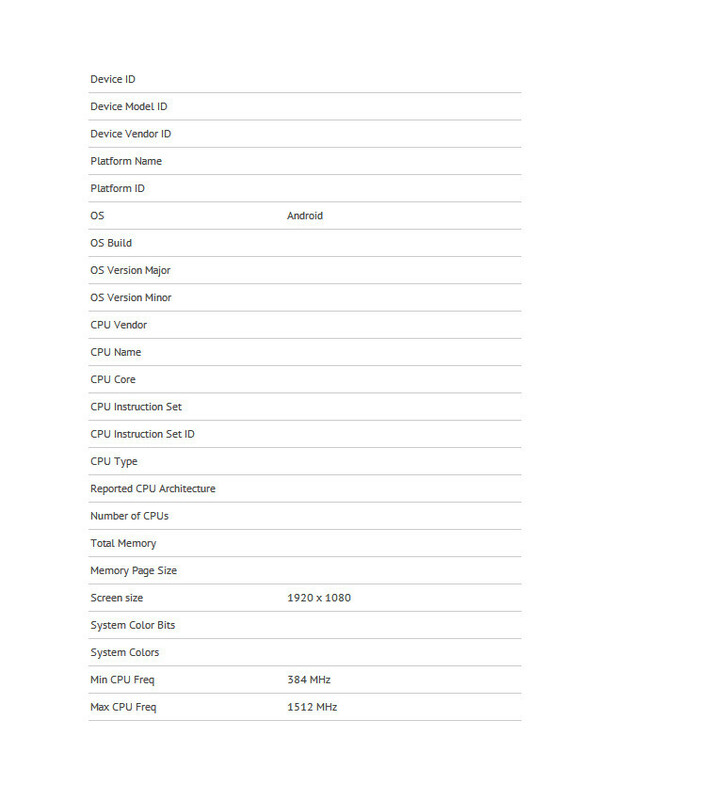 That single feature right there is enough to cement the smartphone into the high-end category, along with the HTC Droid DNA. The processor inside it is no slouch either. 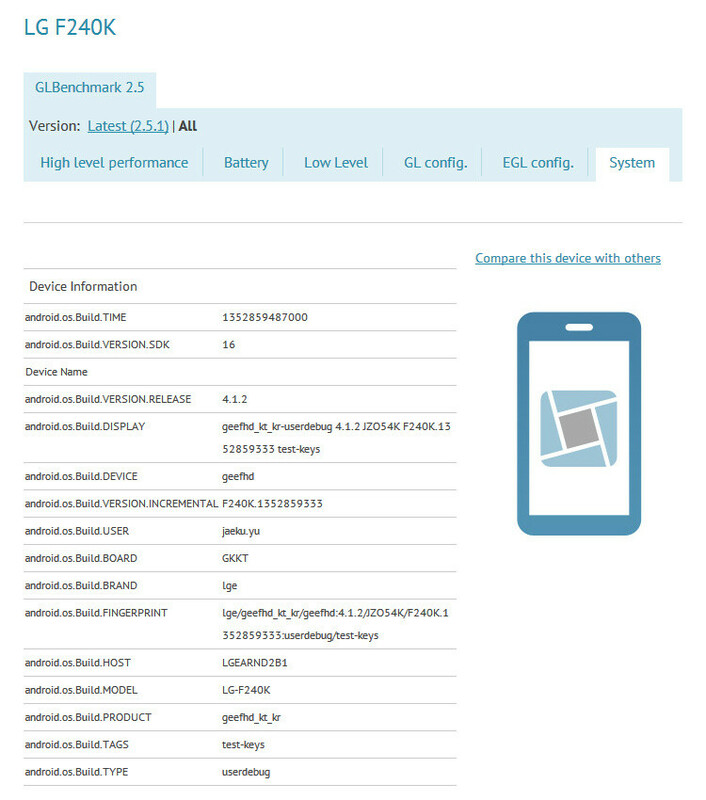 As revealed by the data in the benchmark, the SoC used comes with Adreno 320 graphics, which indicates that a Snapdragon S4 Pro chip is ticking inside this new, mighty LG smartphone. 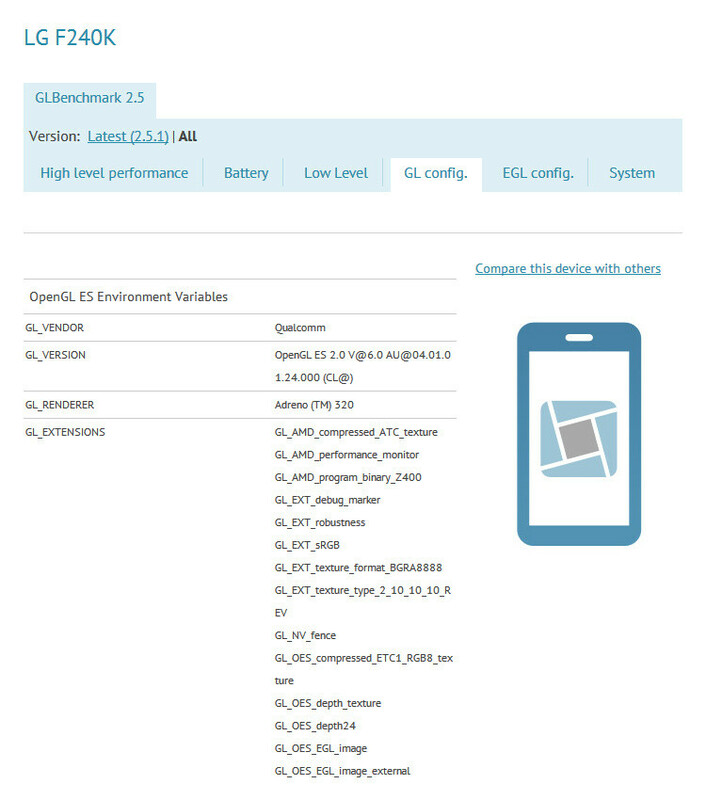 That is most likely the quad-core APQ8064 running at 1.5GHz. 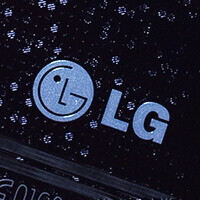 Further details about the LG F240K remain unknown at this time, but we'll be keeping our eyes out for more leaks. In the meantime, feel free to examine the evidence below. ...and 1080p becomes a normal resolution for mobile screens!! Exactly. In 18 months, we have gone from 800 x 480 being the standard resolution to now 1080p showing up. In that time, processors have gone up from single-core to quad-core and some Cortex A15 variants showing up. Battery life? It seems to be going backward. The spec war needs to stop, or slow down, and work needs to be done on improving the usefulness of UIs, improving the UX, and extending battery life. i bet the dna will be the one x again when the S4 comes around. Unfortunately, that just might be the case. We'll see what happens. Maybe. Maybe not. and there is no reason make 1080p screen for mobile too. Our eyes can distinguish pixels at 320 plus, it all depends on the length at which the screen is being held away from your face. The main advantage of having higher resolution isn't about seeing pixels it is about making the image look cleaner. Even if you can't see the pixel you still may see blurring that occurs, higher resolution provides less blurring. Go LG! The huge success of the Nexus 4 has gave LG great traction in this highly competitive mobile industry. Next up we'll have ARM's new A50 series chips enabling smart phones to pump out 2GHz, 4GB RAM, 125GB on board storage, and possibly 2.5k resolution! Watch! is it just me, or do those benchmark scores not look very good? both onscreen and offscreen are under 20fps.